Andja Mamula would have known this version of "Boze Pravde" during her years in America. The label is courtesy of Steve Kozobarich of Cleveland, OH, to whom we are so grateful! Although I know this clothes my Baba wore when she came to Pittsburgh, PA in Nov. 1900 should be in a museum, I'm reluctant to part with it. It's been a part of my life ever since I was at least 10 years old, which is now more than 50+ years ago, when I would wear Baba's folk outfit as my Halloween costume year after year! How delighted I am to be able to share this with all of you in this special way! Andja's full woven cotton skirt, with the pull-tie waist. I always said they were ahead of us with the "permanent press" factor, as no ironing was ever needed with this woven design. The heavy woolen apron was folded over in half at the waist and attached with a simple red ribbon at each end. The apron was colorfully woven, but used "coarse" woolen materials. The design is native to the Slavonian region. Unfortunately, over the course of 108 years, the moths have found the apron very appealing, too. Here's the back part of the apron, with not as intricate a design as the front, just an easier to make, striped design. (Looks like the moths liked this side even more! Andja's blouse was hand-made from the loomed cotton. It featured very puffy sleeves with lots of room, with woven colorful woven panels attached for decoration. A draw-string neckline with a small amount of decoration both at the top of the blouse and some crocheted work at the bottom, finished it off. Crocheted work at the neckline. There was also some of the bottom of the sleeves. Woven panel decoration coming down the side of both sleeves; crochet work at the end points. Note the blouse was made of the same "permanent press" type of woven cotton. At the time of the 1900 Census, Nikola Mamula was living as a boarder. Although Andja arrived that same year, the census had already been taken. Thanks, as always, to Cousin Marti Grimes, our family genealogist, for the Census help. If you click on the photo, you can make the image bigger! 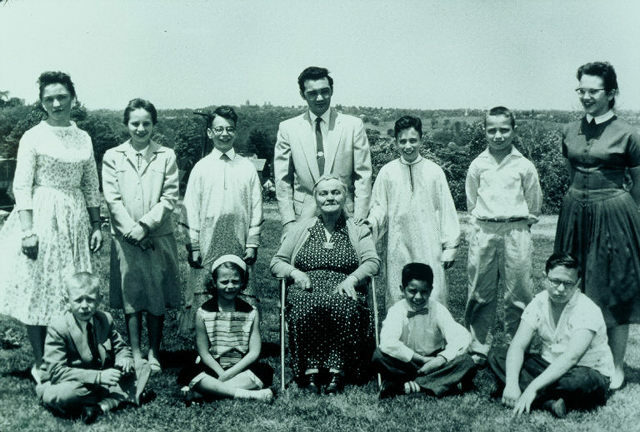 Ten years after arriving in Pittsburgh, Andja (29) and her husband Nikola (37) had three children listed on the census, Joseph (7), Stephen (2), and Martha (1). The census doesn't show the agony felt when the couple lost 3 children in between Joseph and Stephen. 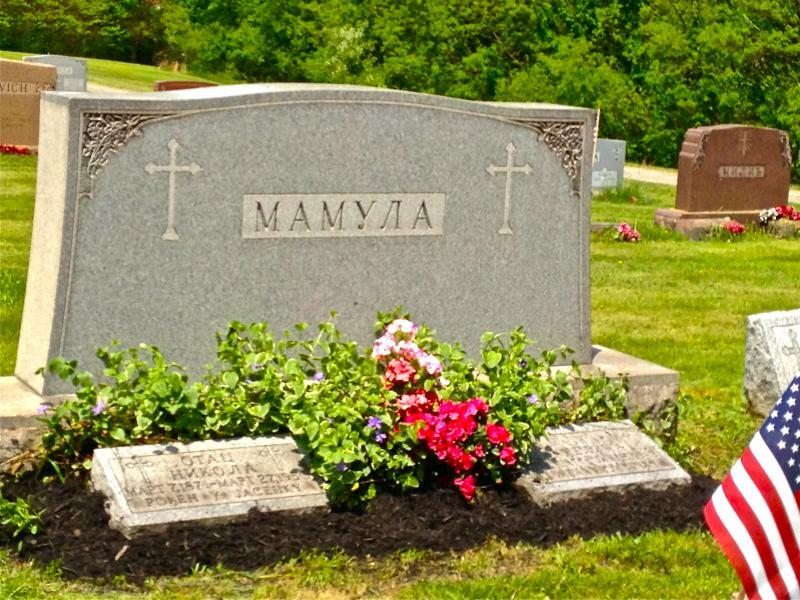 (See Andja crying over her infant's grave 1943 on the Pittsburgh section of this website.) Children who died were Milosh (1902-1903); Marta I (1903-1904); Ruzica I (1904-1905). Besides their own children, living with the Mamulas were Andja's brother, Rade Mamula (22), Paul Curudia (30), and Stanley (25) and Peter Kosanovich (22). These boarders were always treated as close family members. Important! All of them were listed as Aust-SERVIANS! The couple, their children and boarders lived in the REAR of 2527 Sarah Street. By now, Nikola was a FOREMAN in the mill. Three of the boarders were Laborers in the mill, but Stanley (Stanko) was a brakeman. All were educated. (Six children had been born to them by this time, but 3 died young, only 3 surviving: Milosh (1902), Marta (1903) and Ruzica (1905). Ruzica was the first child buried in St. George's cemetery in 1905. Nikola was already a Foreman in the Jones & Laughlin (J&L) Steelmill. They were ALL Servians but the Father's and Mother's birthplace was listed as AUSTRIA. They lived at this time at the REAR of 2527 Sarah Street. Nikola Mamula, born Sept. 25, 1871, left his home in Ogulin, through the port of Antwerp on the 27th of November, 1898, arriving on the vessel FINLAND at the Philadelphia Port (NOT Ellis Island) on the 24th of December, 1898. Nikola declared his intention for citizenship on Sept. 17, 1913. His citizenship papers were finally signed on Nov. 15, 1915, although there was a date indicating that he had tried to do so earlier (Jan. 1902 which didn't meet the 5 year living in the U.S.A. requirement). Nikola's two witnesses were Joseph Wilheim (liquor dealer) and Bozo Kosanovich (laborer), his best friend and KUM. Two clerks, J. Wood Clark and B. Hoffberger signed the papers making it official. At the time, Nikola was married to his wife ANNA, and had 6 children: Joseph, Steve, Marty, George, Rose and Millicent. Laura (Latinka) was not yet born. Interestingly, most of the birthdates listed for the children were wrong. At this time (1915), the address was given as 2817 Jane Street. But by the time President Roosevelt visited Pittsburgh, the Mamula's home was on 2716 Sarah Street where they lived on the 2nd floor only. Below, rented out on the first floor, was the SWOC--- the Steel Workers Organization of America. Andja and Nikola's granddaughter and great, great granddaughter share their cookie recipe with you! if you want, 1 teaspoon of rum or whiskey! Mix the butter, flour, sugar, and salt. Work well. Then add vanilla (and rum or whiskey too if you want!) and the nuts and mix, mix, mix well. Roll into balls. The oven should be heated to 350 degrees. Bake for 20 minutes. Let cool and then shake into a bag of powdered sugar until all covered as Jocelyn and her Baba are doing here. The longer the butter balls sit around, the better they taste, but we warn you ahead of time, they don't last long! 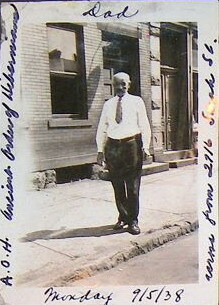 "Papi" Nikola Mamula, across the street from his home at 2716 Sarah Street, 9/5/1938. Here's our Baba Andja, front and center as President of the Majka Jugovic KSS of St. George Church on S.16th Street, Pittsburgh's South Side. Behind her is the priest, Rev. Fr. Alexije Savich. To Andja's left (our right) is Andja's oldest daughter, Martha Mamula (Belosh). Click the photo to enlarge. "It is now 4:30 AM. I got up early because Paj (Paul Belosh-son-in-law) has to go to work early. I went back to bed for a little. Milca (daughter) went to work and I am working on chores around the house. "At 9:00 AM, my (son) Stevo called me and asked if I know what happened in the news. I replied, "No." He told me that King Peter II ascended the throne and took control. I couldn't be happier, I couldn't even talk from such joy! I thought my heart would burst. The Serbians never let anyone take what is theirs. I'm praying to God that He helps our dear and wonderful King Peter II........."
King Peter II kissed her hand in the Schenley Hotel's Grand Ballroom in Pittsburgh on Tuesday, June 22, 1948! At the very large banquet gathering, the always sure of herself matron stood up and said to the whole assembly that she would like to kiss King Peter's hand for being so brave defying Hitler and preserving the Karadjordje name. "Mrs. Mamula," he said, "it is I who wants to kiss YOUR hand for all your kind words, etc." I have always loved that story! Was it true? Did I have the right date? 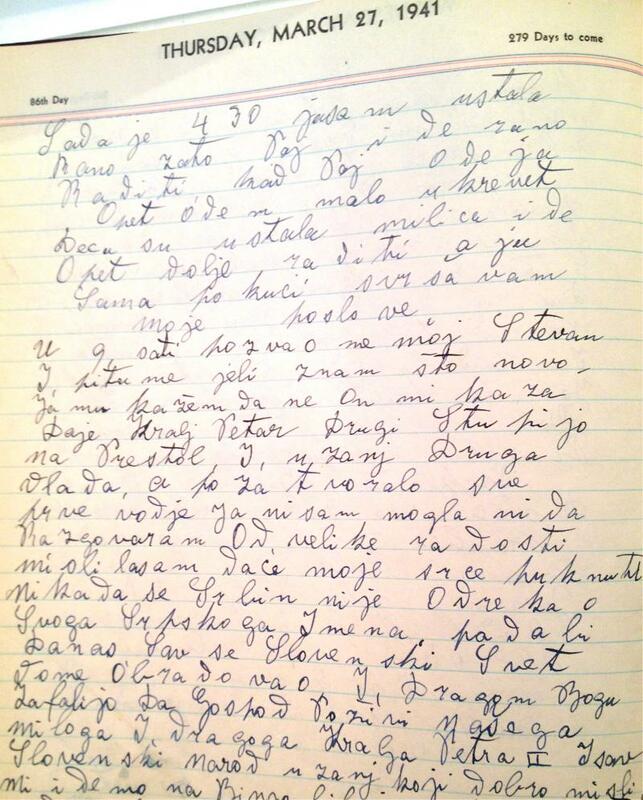 Tonight, Thursday, June 5, 2013, at 10:53, I searched out Baba's diary from 1948. Baba has it all written down! "Sada 6 sati jasam ustala i tako i moju Marta. Deca danas dobili karte od skole i nece vise u skolu do Spetembera. Zvala moju Ruza. Onace doci ove. A mi idemo da vidimo nasega Kralja Petra. Daj mu Boze Srecu i napredak. "Mi smo prosle vec je Halu bila jako napunjena sa Svetom. Ali smo dobili lepo mesto. Dosao nas Kralj i neje moglo lepse da bude. On se sa svakim rukovao i prosli smo svi u Senli Hotel. Bila Bogata vecera, Velike Govornci i nas Kralj jako lep govorijo. On je 3 puta pozdravila, i on je ustao i podigao casu vine u moje ime pod sav narod pozdravio! I got up early at 6 AM, and Marty did too. The kids (that's us-grandchildren) got their report cards today from school and don't have to go back until September. My Rose called and will be coming here. We're going to go see our King Peter. May God grant him good fortune and Leadership. When we got there, the Hall was completely full like the whole world was there, but we had good seats. Our King Peter came in and couldn't have been nicer. He shook hands with everyone in the Schenley Hotel. We had an exceptionally rich meal and afterwards, our King spoke very well. He "Long Live"" 3 times and he rose with his glass and in front of everyone raised it to me in cheer! Cemetery lots at St. George Cemetery in Pittsburgh's Carrick section: Nicholas Mamula bought them in 1929, certificate #107, lots 7&8, Section H, plan book vol. 24 pp. 64,65, for 320 square feet.﻿ (Even though Ruzica was the first child buried at St. George Cemetery in 1905). Joseph (Josip) 9/6/1901; Stephen (Stevan) 10/21/06; Martha (Marta) 10/1/08; George (Djuro) 3/6/1911; Rose (Ruza) 5/22/1913; Millicent (Milica) 8/16/1915; Laura (Latinka) 9/12/1918. "The name 'Mamula' is of Turkish origin. It seems to have been Serbianized in the 15th or 16th centuries. Most Mamulas are of Serbian extraction. "The Mamulas are found in the villages of Koanovici, Tuk, Srpska Moravica, Hambariste, Vrelo Jasenacko, Ogulin, Hajdine, Vrbovsko, Severin na Kupi, Ogulin and Musulini. "The crest was given to one Manojilo Mamula (Emmanuel (or Moses) Mamula) of Ogulin who was a Major in the Military Frontier by Austrian Emperor Leopold I, August 29, 1790, in Vienna. "A Lazar Mamula was also granted a Crest of arms on January 9 (St. Stephen's Day), 1857 by Emperor Franz Joseph I. Lazar was the Military Governor of Dalmatia. "The colors of the Coat of Arms are blue for the horizontal line, red for the vertical line, gold for the dots and silver for the field. "The people of this region were recruited to defend Europe which was being invaded by the Turkish armies that have conquered most of the Balkan Peninsula by the 15th century. They were given land and guns and were settled along this perimeter known as the Cordon Militaire which affected the geo-demographic process of migration of Serbs to Croatia from Hercegovina and Montenegro and Serbia. "The people who came here were given land and guns and were never feudal serfs under this arrangement. "Origin of patronymics are of many sources; Musulini, Italian; Mrvos, Wallachaian (Roman), etc. 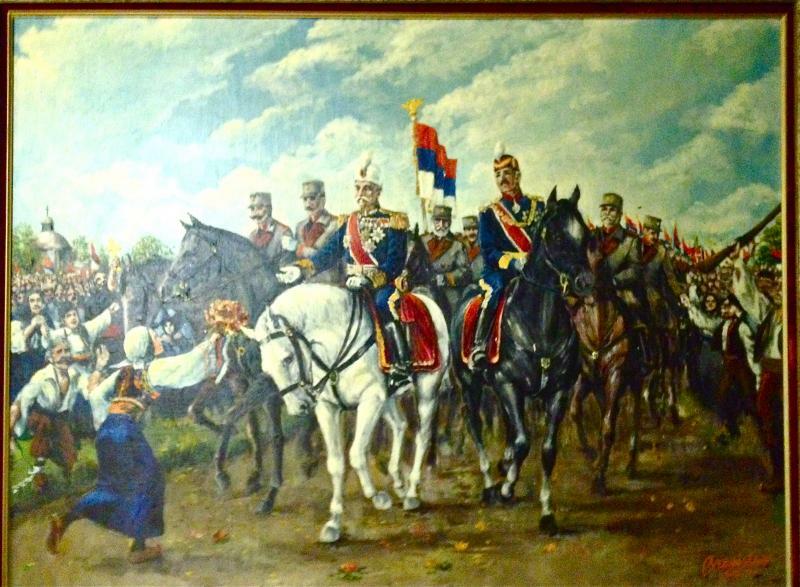 Most of the Serb patronymics are originally Serbian and have been named after geographical areas: Kosanovich comes from kosa, mountain ridge; trades, Oklabdzija, armor; etc. " FR seared (L-R): Nick Mamula, Lorraine Bobik (Moon), Paul M. Belosh, George Zoroya. Back (L-R) Marty An Zoroya, Rose Karlo (Gantner), Jules Bobi, Ronald (Vladimir) Zoroya, Joseph Bobik, Peter Zoroya, and Milana (Mim) Karlo (Bizic). The youngest (Alexandra Karlo) is missing, she was running around. 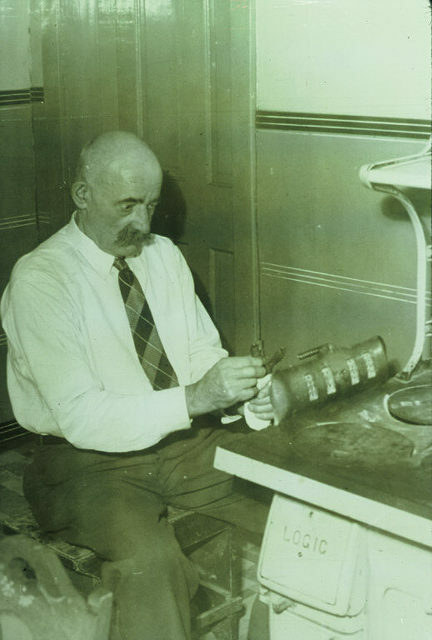 Nikola Mamula making his beeswax candles for Serbian Christmas. 1948. Photo by Milan M. Karlo. 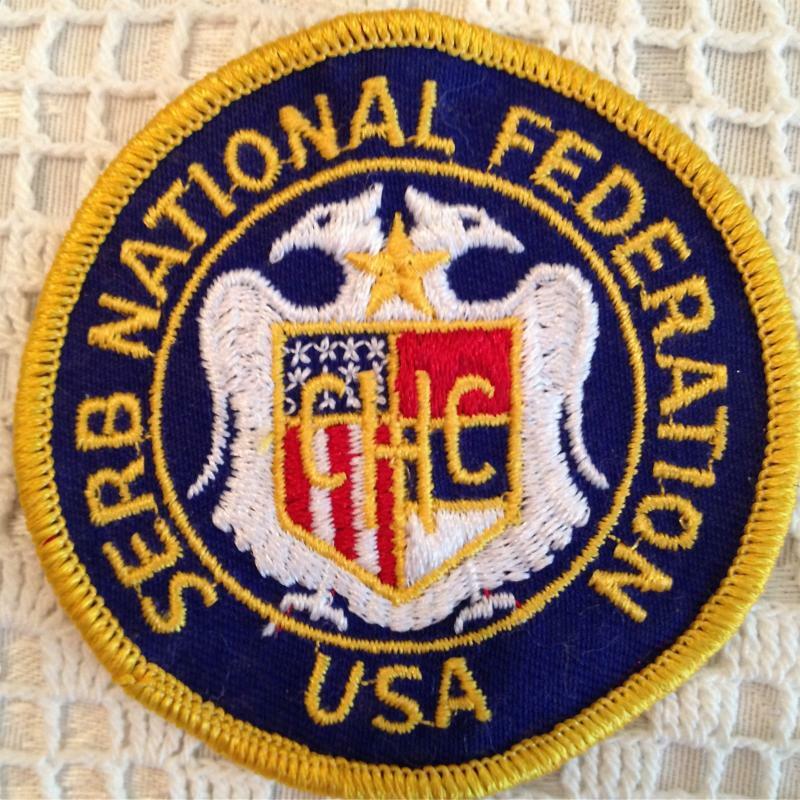 American Serb Life Magazine, Jan/Feb. 1948. All the Mamulas were/are VERY proud of their American SERB heritage. Here, the late+Laura Mamula Karlo displays a book written, edited and published by Bill Dorich of California. Bill gifted every member of the U.S. Congress with one of these books so that they knew more about the horrible mistake they made in the Balkans, siding AGAINST the Serbs, their loyal WWI and WWII allies. There is tremendous documentation in this book about what happened in WWII and again to the Serbian Orthodox people in the Krajina, Bosnia and Hercegovina and Kosovo regions of the former Yugoslavia during the last 20 years. Laura was the youngest child of Nikola and Angeline Mamula. M/Sgt. 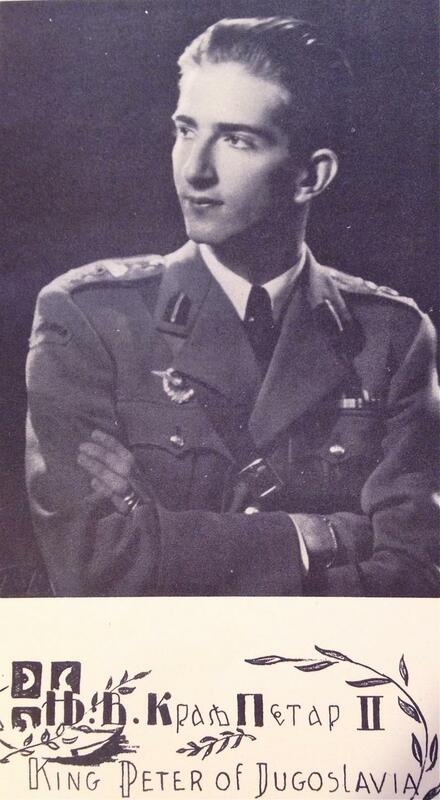 George Mamula, the fourth child, and third son of Nikola and Andja Mamula was born in 1911 and died at age 63 in 1975. A career soldier, he was known worldwide for his bravery in action, receiving the Distinguished Service Cross in Korea, along with 18 other combat decorations and awards. He was a member of the distinquished Merrill's Marauders during WWII.He belonged to the Legion of Valor and his deeds are enshrined in Pittsburgh's Soldiers and Sailors Hall of Valor in Pittsburgh. "George Mamula was the most knowledgeable and experienced soldier that I ever met during my 28 years in the Army! During WWII, he was assigned to Merrill's Marauder's during their famous incursion into Burma. During that operation, George was presented with the Distinguished Service Cross, the nation's second highest award for combat action next to the Medal of Honor. "Later, during the Korean War, MSG Mamula served as a 1st Sergeant in the 2d Infantry Division. Again, he was honored for gallantry in action and presented with the Silver Star. Later, George was assigned as 1st Sergeant of 3d Infantry Regiment, Ft. Meyer, Washington DC. "Everything important that I learned about the Army was a result of "being under the wing" of MSG George Mamula! At 19 years old, I was accepted to attend Infantry Officer's Candidate School at Ft. Benning, GA. In 1976, after having served 3 combat tours in Vietnam, I was promoted to major and was on a TDY trip to Wash DC. George had retired and was residing at the Old Soldier's Home, Washington DC. We spent about 2-3 hours on our last visit." Charles E. Whittle, Colonel, US Army, retired. Message Board, Ancestry.com, 2 Jan. 2014. Both Andja Mamula and her husband whom she married in Pittsburgh, PA, USA, were from Vrelo, Jasenak, Ogulin, Lika, by the Gormije Monastery. Here are some maps to help orient you as to where they lived. The Karajlovichs were from Primishlje, near Terzic, Slunj, Kordun and weren't that far away either, as the map shows. Nicholas (59) Head of Household; his home at 2716 Sarah Street was valued at $4,000 in 1930. 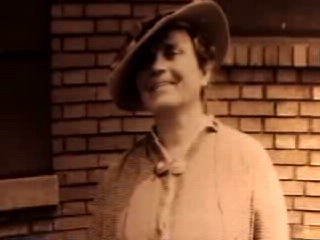 Aunt Nellie (Mamula Trbovich) came to live with Baba when her mother, Marta Mamula Trbovich died. Baba Andja always considered her another daughter. Andja Mamula Mamula was my grandmother, someone I loved with all of my heart and was so proud to call "Baba." Andja Mamula was a former elementary school teacher (grades 1-4) from the little Serbian village of Vrelo, Jasenak, Ogulin, located not too far from her beloved Serbian Orthodox Monastery "Gormije," where the villagers celebrated their important Feast Days, all then a part of the Austro-Hungarian Empire's "Militaire Kordun" or Military Frontier, (Now just "Croatia"). Andja's parents were Marko Kovachevich and Angeline Evosevich Kovachevich. Her parents were Rade Mamula and Rose Kovachevich Mamula. Andja's brother, Stevo Mamula (1874-1948) was the first in their immediate family to go to America. He worked in the Pittsburgh steel mills, finally saving up enough money to send for his oldest sister who had taken such good care of them all "in Stari Kraj" (the Old Country) after their own (Andja, Stevo, Rade, Marta) mother died young. Andja arrived in Pittsburgh, PA, USA via the train station that now houses the "Grand Concourse" Restaurant at Station Square in the former P&LE RR Station. There was a whole contingent of Serbian immigrants out that day to welcome their friend Steve's older sister, and as with any crowd, were happy and boisterous. The brawny and strong young men had eagerly watched as the people on the arriving train had deported, scattering here and there with relatives and friends. But where was Andja? 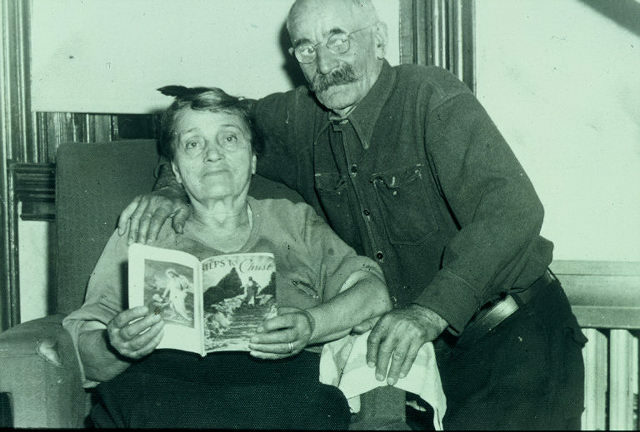 Stevo was glad Andja had Milica Mamula (a friend) for a traveling companion on the 13-day journey to the New World. Milica had been welcomed to Pittsburgh wholeheartedly by the many men present, especially so by her loving husband, Radan Mamula. Soon, they would be traveling together to his residence at 2700 South 27th Street on Pittsburgh's South Side, finally as husband and wife once more. Many other Serbs lived tightly together in the neighborhood, Radan knew Milica would feel right at home. Why, Stevo only lived only 1/2 way around the block at 2814 Carson Street, so Milica and Andja could STILL be the best of friends. Milica took time out from all the excitement surrounding her to explain to Stevo that there was a little trouble at the end of their trip. Andja didn't want to get off at the station! Stevo had to board the train to get his recalcitrant sister off the conveyance that had brought her from New York City where she had been prior to arriving in what became known as the "Smoky City." Stevo expected a smiling Andja, and had hoped to hear his 22 yr. old sister's trip from the port of Antwerp was trouble free once she landed on Ellis Island in New York from aboard the SS (Steamship) Noordland, Nov. 30, 1900. So unlike the confident Andja he left behind, Stevo was baffled by his sister's shy behavior this day. Hiding behind her dear brother's coat tails, she stood fast on the train's platform, reluctant to let go of the hold she had on the metal pole in front of her. Perhaps she knew her fate, her whole future, was about to be decided. Soon. Real soon. Andja could see the swarm of young Serbian men, gathered as in a hive on the RR tracks, all waiting to eagerly please the soon-to-alight "Queen Bee. " Each masculine J&L Steel Drone wished to be "the chosen one," the lucky man to win her hand. For years, the young Serbian men hadn't seen any of their "own" women in America, and most were slaving away in the mills. Slavic women in Pittsburgh were a real rarity in those days. These young and virile men worked 12-16 hour days seven days a week, many living as boarders in rooming houses that could hold "extended" families of 10 or more people living in cramped quarters. Each of these men would dream about the day they too could get married and start a family of their own. Coming forth soon from the P & LE RR station was "one of their own" ---one who could speak their language, cook their food and clean their clothes, and sing Serbian lullabies to their children. Andja saw the band of eager young bucks waving their $50 bills in the air. No wonder why she was frightened. She didn't want any part of it. Stevo was trying to reason with his sister, to reassure her these were all good friends. "No, no, no..." she cried. But just then Andja saw a head sticking out, up from the crowd. Nikola Mamula, standing 6 ft. 1" tall at the turn of the last century was almost a head taller than all the others there. No wonder why his nickname back in the Old Country was "Nikola SUSAK." Not only because there were a lot of Nikolas in their village and this would be one way to distinguish him from the others, but ALSO because he was as tall as a tree in the forest! Andja's glaze focused on the tall fellow. She didn't know Nikola at all personally, but she had seen him before! She recognized him as being from the town where she would go for water and other necessities. The two had never formally spoken, but at least his face was one she knew, some one with whom she could have at least something in common. "Oh, let it be him!" she pointed out the tall stranger to her brother. Stevo knew Nikola well from working in the mill, and already being a leader of the men. But there was a problem for our heroine and her brother! Nikola wasn't one of those waving his money about. He didn't HAVE any money to barter with as he sent much of his earned wages back to the Old Country to his family left there. And besides, he liked to have some good times with his buddies after work too, in the many bars that lined E. Carson Street where the mill gates were. But hold everything! Upon making eye contact with Andja, our up-'till-now reluctant hero, Nikola started pushing his way to the front, shoving aside many of his young friends just as Moses parted the Red Sea. Nikola's "manhood" kicked in. Suddenly he decided he didn't want to just be there to see this "Srpkinja" coming in, but he, too WANTED this woman as his wife! Soon Nikola was confronting Stevo, eyeball to eyeball, two chests beating and heaving closely together. "I don't have the money now," Nikola was almost yelling at Stevo who stood so close to him, "but I promise you, I will get it. You know I am good for my word!" Well, I don't know what exactly followed after all the other angry and disappointed young men left the station, but from marriage records at the Allegheny County Court House, I do know that less than a few days later, Andja and Nikola were married. And yes, they did live happily (most of the time!) ever after. 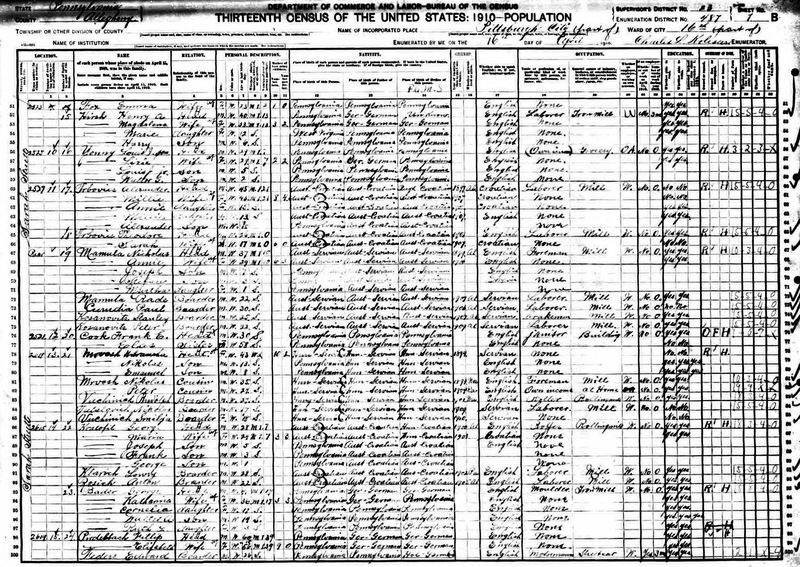 The 1900 U.S. Census taken on June 2, 1900, shows that Nikola Mamula, who had served in Austrian Army under Emperor Franz Josif at the age of 21, was one of six borders living with Petar Vujnovich (it says Vujnowiz) and his wife Amelia, with three daughters, Mary, Sophia (9), and Annie (3), and a young son (age 2) named George, at 2721 Carey Alley (Way) on Pittsburgh's South Side. The other borders were Sam and Stevan Mamula. The Census indicated that Nikola had been in the country since 1894 (or six years). Only 5 months later, the 30 year-old Nikola Mamula was at the train station, and claimed Andja Mamula as his bride! Andja & Nikola Mamula & their 7 month old granddaughter Mim Bizic (Milana Mamula Karlo) in front of their home at 2716 Sarah Street, Pittsburgh's South Side. By the time of the 1930 census, Nick was 59, Angeline (Andja) was 52; son Joe was 28 and a rigger in the mill. Uncle Steve was 23; Martha 21 and working as a Stenographer at a Leather Shop, George was 19, Rose 16, Millicent 14, Baby Laura was now 11. Also living with them is Andja's niece, Nellie Trbovich, age 15. In the 1910 and 1920 Censuses, the Mamulas wrote they were from Aust-Servia, and that they spoke Servian. 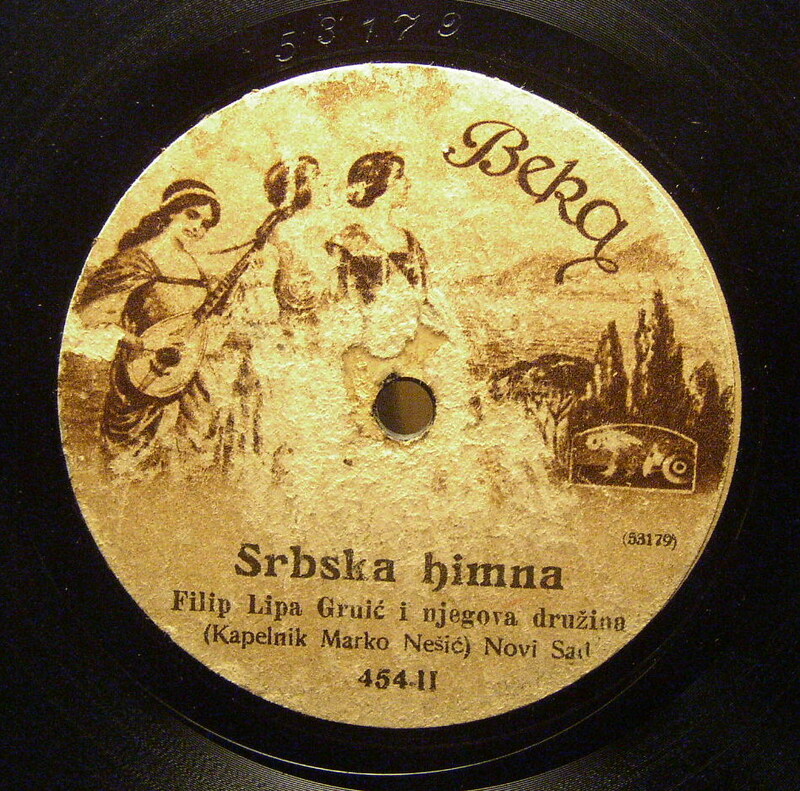 By the 1930 Census, they said their country of origin was Yugoslavia, but they spoke Serbian. For Andja's Brother Rade, when living as a boarder with his sister, he was recorded as being from Aust-Servia and speaking Servian. However, the 1920 census has him as being from Hungary and speaking Hungarian. In the 1930 census, the report says he was from Austria and spoke German! It was a mixed-up time for most immigrants. As cousin Marti, the genealogist says, census data can be misleading, just like when reading Death certificates. A lot depends on WHO gave the info and WHO the census taker was. The other issue was the language as some immigrants were frightened and didn't understand the questions being asked, sometimes giving info based on what they thought were in their best interests. Records have to be checked and double-checked for accuracy. For instance, if you look up Andja Mamula's record of arrival in Ellis Island, there are several inconsistencies. The electronic date says the ships' date of arrival was Nov. 11, 1900. However, upon further research, you will see that the original ship's manifest, signed by the Ship's Master, Frank Loesciwitz, states that the ship sailed from Antwerp on Nov. 17, 1900, so how could it arrive on the 11th? The journey ended, according to the good captain, on Nov. 30, 1900. Someone wasn't careful in recording the information. Another error was saying that Andja was a male. Another recorded Andja and Milica as not being able to read or write. Andja was a teacher in her village, so it is safe to say she could do both! The marriage certificate on file with Ancestry.com says that Nikola and Andja Mamula were married November 13, 1900. Stevo sponsored all of his family members in his quest to get them all to America: sister Andja, brother Rade, and sister Marta. FINALLY, there were all together again, this time in Pittsburgh, PA, USA, far from their home in Vrelo, Jasenak, Ogulin. Sadly, Stevo and Andja's brother Rade died in an accident in the Steel Mill, and their younger sister, Marta, died not long afterwards following childbirth. So disappointed and overwrought with the tragedy that befell his brother and sister, Stevo went back to the Old Country, settling back in their old village. However, he and his family had to flee to Belgrade during WWII, where some relatives still make their home. had 6 brothers: Djurach, Radan, Glisho, Bozo, Sava, (Nikola) and Mile. Nikola was the youngest son of Josip and Marta Kosanovich Mamula before his mother died when Nikola was only 6 months old. However, Nikola was always proud to have been raised by a very kind stepmother who then had her own son, Mile. Mile's first son was Sava. Sava and his wife Ljuba had two children: Vlajko & Milena Mamula Danilovich. Vlajko recently passed away, but Milena welcomes her relative, Pittsburgh Milana, to Belgrade everytime she comes! Sava, Mara, Nakica, Marko, Dushan. 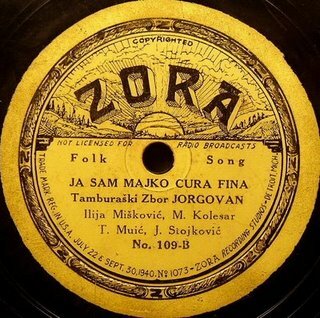 To hear more old time Serbian records, be sure to check out the website of our wonderful contributor, Steve Kozobarich from Cleveland. The recordings on the top of this page are also from Steve. "Ja Sam Mala, Cura Fina!" This one is for you! Your children are all gone now and with you in Heaven, but your grandchildren, great grandchildren and great-great grandchildren are still carrying on your love for this song! "They marched along, they marched along, King Peter's Royal Guardsmen." On Mother's Day, 2013, Andja's great, great grandchildren (4th generation in America!) Michael (Bobik) Trklja and his cousin, Alayna (Bobik) Grese sang and danced with the Jedinstvo Folk Lore group at Baldwin High School. Baba Mim gave them pens with this image of King Peter and his Royal Guardsmen to commemorate the day! which award she received on July 15, 1983 at the 66th Annual Celebration at Kennywood Park, during the 3 Pitt Serb Days. Born Oct.1, 1908 on Pittsburgh's South Side, she was the 3rd of 7 surviving children (3 died early) born to Nikola and Angelina Mamula. At age 16, because of her fluent knowledge of the Serbian language, got her first job at the Sloboda Society, with the late Branko Pekich. Her father was Treasurer of the SNF Lodge No.6, "St. John's," one of the first SNF Lodges and her uncles, Stevo and Rade Mamula, were among the first Federation members. Her mother was President of the SNF Lodge 18, "Majka Jugovica"- an all ladies lodge. Martha was one of the first members of the Junior Order Kolo No. 1. She was the third person to be signed up as her brothers Joseph and Stevan were ahead of her. Joseph, who was first, later received a special SNF ring. In the Jr. Kolo No. 1, she was an active member, and later served for many years as its Junior Order Elder, and as Financial Secretary, Treasurer, and Recording Secretary. Later, she moved into the Senior Lodge. 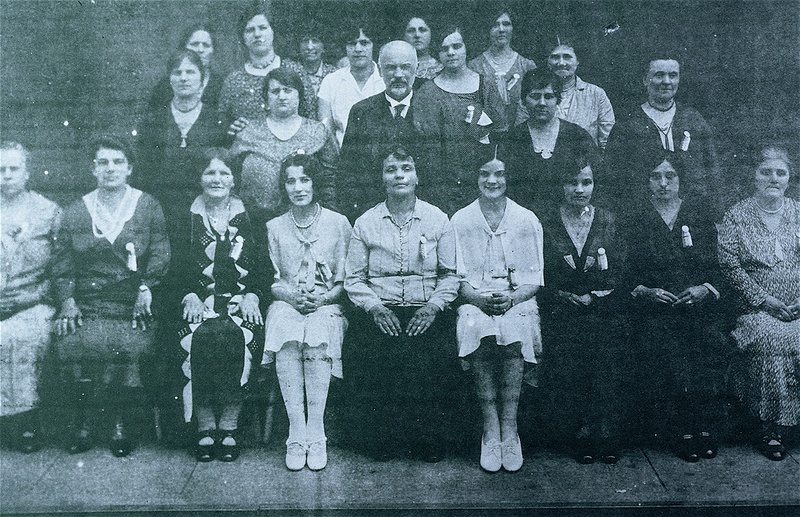 First to the SNF Lodge 18--the all ladies lodge, where her mother was President, and later to SNF Lodge 11, "Vojvoda Stepa Stepanovich" in Pittsburgh. She was elected to the position of Financial Secretary, Treasurer and Recording Secretary, a post she held until her death. She attended the 1971 SNF Quadrennial Convention in Windsor, and in 1975 in Cleveland, OH. At both Conventions, she served as English Secretary, while hearing both languages interchangeably. 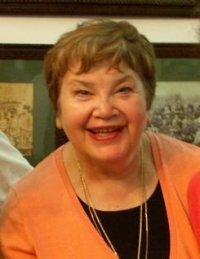 She was a founding member of the SSS Philip Visnich Choir of St. Sava's Church in Pittsburgh, a member of the church, and served on the Board during WWII. She was also a member of the Kolo Srpski Sestara. 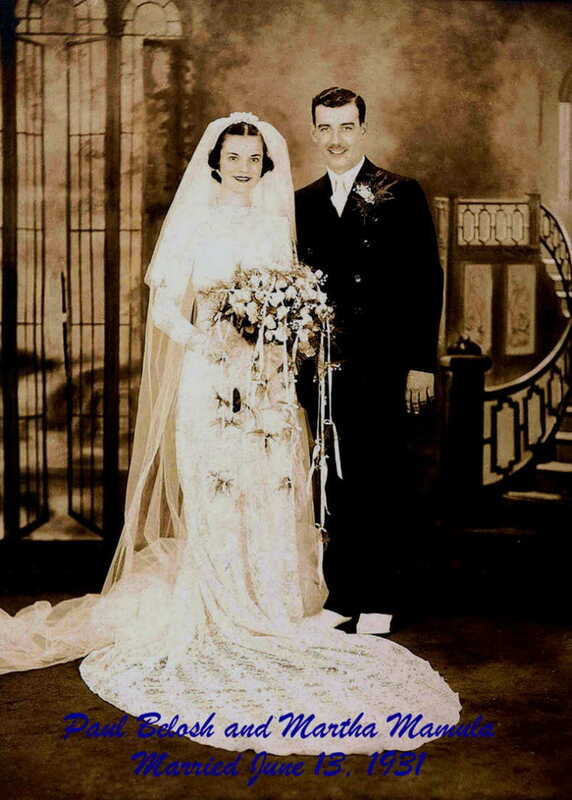 In 1937, she married Paul Belosh (Belus) of Freedom, PA, and had one of the largest Serbian weddings anywhere. To them, son Paul Mamula Belosh was born on October 18, 1947. Husband Paul passed away in March, 1975. PMB married Kathy Smith (4/23/50) and they have two children, Halle Anne and Jordan Paul, whom Martha loved dearly before passing away on Dec. 28, 1988 at age 80. Halle (11/21/1983) married Matt Benusa (1/5/82) on 8/8/09; and Carli Hoehn (1/27/88) became Mrs. Jordan Belosh (9/26/85) on 9/5/12. The family unit can be seen supporting all of the many Holy Trinity Cathderal affairs, or at SNF functions, working and helping, whether helping with the Fish Fries, or always taking the FIRST SHIFT at the bar on the at Castle Shannon's Holy Trinity's St. Sava cemetery/picnic grounds. The whole family can also be found at Shadeland for the Annual Diocesan Days. Baba Andja would have been so proud! award at 91st Serbian Day at Kennywood on July 18, 2008.